The "very senior" member of President Donald Trump's transition team who directed former national security adviser Michael Flynn to reach out to Russia in an attempt to delay or defeat a U.N. resolution on Israeli settlements before Trump took office was Jared Kushner, sources with knowledge of the investigation confirmed to ABC News. Court documents filed by Special Counsel Robert Mueller today cite the “very senior” transition official but do not identify him. Flynn has promised “full cooperation” in the special counsel’s Russia investigation and is willing to testify that Donald Trump directed him to contact the Russians, initially as a way to work together to fight ISIS in Syria, according to a confidant. Bloomberg first reported that Kushner was the “very senior” member of the transition team detailed in the documents released Friday after Flynn pleaded guilty to misleading FBI investigators probing Russian interference in the 2016 presidential election, including about his contact with Russia. An additional "senior official" cited in the documents is K.T. McFarland, the former deputy national security adviser, sources told ABC News. The court documents additionally detail the directions given to Flynn by a Trump transition official about how to interact with Russia regarding sanctions levied against the country by the Obama administration for Russian meddling in the election. In the statement of the offense, accepted by Flynn Thursday and released by the special counsel's office Friday, Flynn is described as having "called a senior official of the Presidential Transition Team who was with other senior members of the Presidential Transition Team at the Mar-a-Lago resort in Palm Beach, Florida, to discuss what, if anything, to communicate to the Russian Ambassador about the U.S. Sanctions" on Dec. 29, 2016. That day, the Obama administration announced it was expelling 35 diplomats and placing sanctions on five Russian entities in retaliation for election meddling. Flynn initially denied that he spoke about sanctions with Sergey Kislyak, a Russian senior diplomat. That denial that was repeated by Vice President Mike Pence in January, but he later changed his story. Flynn resigned in February. The document notes that Flynn and the official went on to converse about "the potential impact of those sanctions on the incoming administration's foreign policy goals" and that Flynn then called Kislyak, and "requested that Russia not escalate the situation." He then relayed the details of their discussion back to the transition official. Gen. Michael Flynn, center, with his attorney, Robert Kelner, right, leaves Federal Court in Washington, DC, December 1, 2017 after pleading guilty to one count of lying to the FBI about his back-channel negotiations with the Russian ambassador. In an interview with FBI officials on Jan. 24, just four days after Trump's inauguration, Flynn told FBI agents that he did not ask Kislyak to "refrain from escalating the situation" in response to the sanctions, according to the court documents. In a second instance described in the statement of offense, on Dec. 22, Flynn was directed by a "very senior" member of the transition team to "contact officials from foreign governments, including Russia, to learn where each government stood on the [Israeli settlement] resolution and to influence those governments to delay the vote or defeat the resolution." That day, he called the Russian ambassador and requested that Russia "vote against or delay the resolution," the documents say. 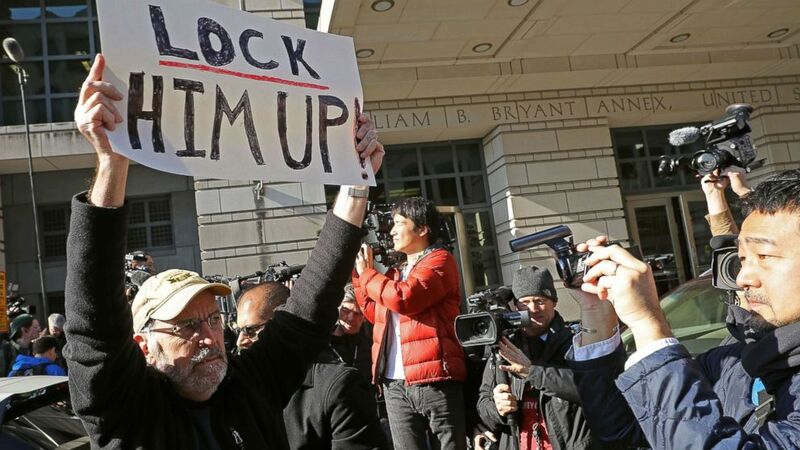 A handful of demonstrators held signs outside the Federal Courthouse where Michael Flynn, former national security adviser to President Donald Trump, had his plea hearing December 1, 2017 in Washington, DC. In the Jan. 24 interview, he denied requesting countries take a particular action on the resolution and said that Russia's ambassador did not describe the country's position on the resolution. 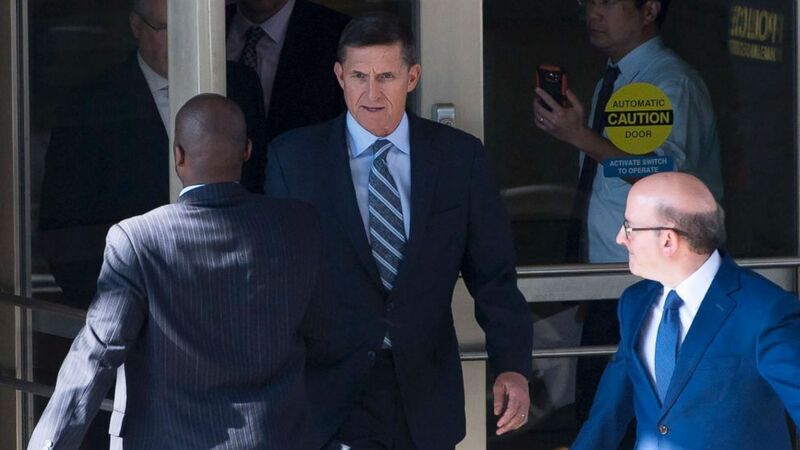 In Flynn's plea agreement, he accepts the charge which carries with it a maximum prison sentence of five years and fine of $250,000, among other stipulations. He further agrees to "cooperate fully, truthfully, completely, and forthrightly" with the special counsel's office and other law enforcement agencies and is required to turn over any evidence of crimes about which he has awareness. Included in the section on cooperation, Flynn further agrees to testify before grand juries, trials and proceedings at which his testimony is "deemed relevant." The additional criminal information document details the charge brought against Flynn for "willfully and knowingly mak[ing] materially false, fictitious, and fraudulent statements and representations in a matter within the jurisdiction of the executive branch of the Government of the United States." In a statement, Flynn said: "It has been extraordinarily painful to endure these many months of false accusations of "treason" and other outrageous acts. Such false accusations are contrary to everything I have ever done and stood for," the statement, dated today said. "But I recognize that the actions I acknowledged in court today were wrong, and, through my faith in God, I am working to set things right. My guilty plea and agreement to cooperate with the Special Counsel's Office reflect a decision I made in the best interests of my family and of our country. I accept full responsibility for my actions."